Are you a keen golfer? Would you like a day of networking while playing a round of golf on a sunny course? 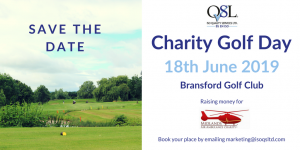 We would like to invite you to join our Annual Charity Golf Day taking place on Tuesday 18th of June at Bransford Golf Club. A day full of fun will begin with networking over bacon butties before you head onto the course for an 18 hole Stableford competition. After a round of golf, you’ll enjoy a two-course meal at the Bank House Hotel. To end the day, prizes will be given to the winners (…and the biggest loser) and a raffle will take place. The day is in aid of Midlands Air Ambulance who receive no Government or National Lottery funding. Each mission costs £2,500 and this is why over £9 million needs to be fundraised every year. We are happy to support such a great charity who help thousands of people every year. We would love you to join us; together we can help this amazing charity! We welcome teams of 4 and individual spaces are also available. The price for the day is £42.50 which includes a charity donation. If this sounds like it is for you, please email marketing@isoqsltd.com to book your place.